At the same time as Zappa was busy preparing the recording of his orchestral scores, he was more than ever behaving as the conductor of his rock band on tour, giving highstanding and technically impressive performances. Some of the orchestral pieces also found their way on the rock albums from this period, the "Drowning witch" album (1982) including "Envelopes", "You are what you is" and "Them or us" (1984) both including sections from "Sinister footwear". The latter composition hasn't been recorded yet in its orchestral form, but the scores are available at Barfko Swill. The subject of this section is continued in the Them or us section. "Ship arriving too late to save a drowning witch" begins with two normal popsongs and then proceeds with an awe-inspiring combination of Zappa's composing skills and improvising capacities on guitar. Zappa would re-use "No not now" for his "Thing-Fish" opera from 1984. It has the same tracks with overdubbed spoken texts. In "Thing-Fish" the "No not now" track is included in combination with a version played backwards. The latter rendition has also the title written backwards: "Won ton on". Both songs are being dealt with in the Thing-Fish section of this study. Regarding its lyrics "No not now" got a sequel with "Truck driver divorce" from "Them or us". Next are regular and unorthodox rock 'n roll, following upon each other on the album. The first is "Valley girl", a piece for which Zappa's daughter Moon suggested the lyrics. Frank took the bait. It has two short rock themes and a vamp, over which Moon is doing her Encino accent. Valley girl, opening (midi file). Moon took an acetate to a radio station and it got that much attention, that it was released as a single shortly after. It climbed up to number 32 in the billboard top 40, Zappa's only serious U.S. hitsingle. It opens in C with the chord progression I-V-VI-V-III. Instead of giving a pedal note, the bass is part of these chords. In bar 5 the music changes to F major/Lydian with the progression F-C-G-Bb. Thus a progression of parallel major triads, causing the B to turn up as both natural and flat. From bar 11 onwards the bass does constitute a pedal note, with the key becoming E Phrygian. Here the accompaniment starts vamping around the chord progression I-II-VI. 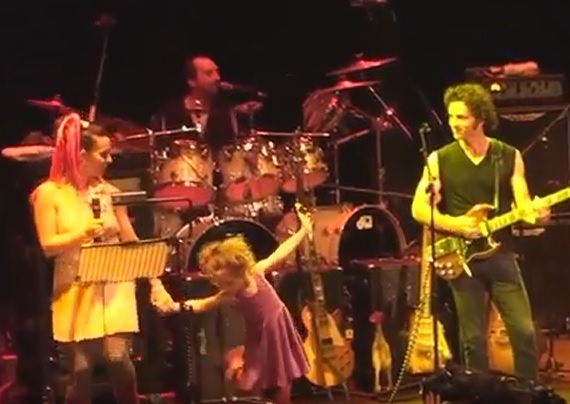 Moon with her daughter, singing "Valley girl" at one of Dweezil's "Zappa plays Zappa" concerts. "Hits are not necessarily musical phenonemons. But as far as my feeling about it goes, I think if that amuses Americans, well, hey I'm an all-American boy. And I'm here to perform that function for you. Since that time, we've hired a guy to make merchandising deals about that song. And you wouldn't believe what kind of things will be coming out with the words "Valley girl" on them. You name it; everything from lunch boxes to cosmetics; including a talking Valley Girl doll in February." On the album liner notes Steve Vai gets credited for the playing of "impossible guitar parts". 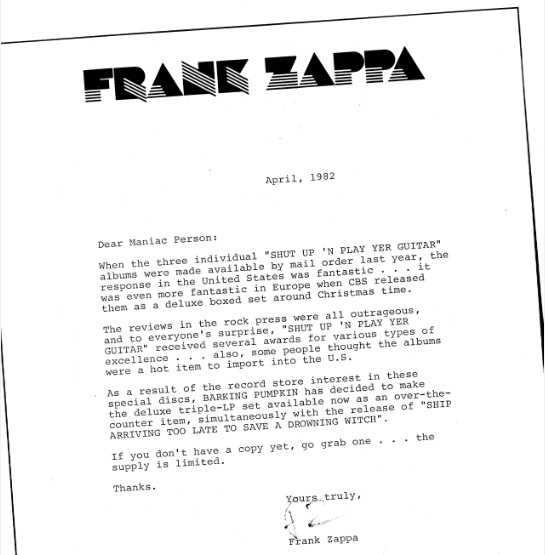 Vai commented that Zappa would frequently come up with try-out scores to see if it was feasible for him to do things on guitar that Zappa himself thought were impossible. Zappa himself in Guitar Player, February 1983, confides to us: "What usually happens is this: if I put another guitarist on my album, I hire that person because he can play things that I can't play. And if the music requires a certain type of performance, and the composition is the real crux of the biscuit, then you don't want to be unfair to the composition and play it yourself if you're going to play it wrong. So I get people who can do it. It's not a matter of being lazy; if there's something on a given song that I think is in my department, I'm going to play it. But if it's something that will be difficult or impossible for me to do, I'd just as soon get somebody who feels comfortable with that style and have them do it." I can only take this for granted, I'm a lousy pianist and I can't play guitar at all. I can only transcribe deducing things - like apparently it goes as such or so -, but don't ask me to play it. The other unconventional example of rock 'n roll is the opening of "I come from nowhere", rhythmically differentiated and using an accentuated dissonant G sharp plus A. Varying meters come along, normal 4/4 and some odd ones. The 27/16 bar is a fast pattern breaking atonal movement, possibly an "impossible one" for Steve Vai. The middle of the song contains an unusual chromatic melody formation, sung over counterpoint bass lines and an ongoing rhythm guitar. A strong guitar solo rounds of this piece. It's embarrassing to see that some of his own fans didn't follow him during this time. Dominique Chevalier concluded in "Viva Zappa" that "Ship arriving too late to save a drowning witch" was second rate and the 1982 Geneva concert, released on "You can't do that on stage anymore vol. V", was stopped just before its scheduled ending because of things being thrown on stage. I come from nowhere, opening (midi file). I come from nowhere, opening (transcription). GP: "On "I come from nowhere" there's a strong dissonance, like a minor second clashing in the first few bars. Is that a guitar?" FZ: "That is a bunch of bass harmonies a half-step apart. He's [Arthur Barrow] playing what I think is a little three-part harmonic chord." So noted. The G#-A dissonance dominates, but there may have been more to it. - Bar 5: an atonal bar in 27/16. First it's a series of six 16th notes, next a sequence of lower thirds, half-way doubled with descant parallel notes. The movement comes at rest on the closing 5th chord. - From bar 6 onwards the song becomes more normal rock 'n roll in B minor, mostly in 4/4, sometimes 2/4. Bars 6-7 form a chord progression, Bm-A#m-E-Db-D, at this point still being kind of chromatic. In bars 8-9 a two-bar vamp gets introduced, doing the chord sequence B-G-F#m7 in rock terms. Thus first two parallel major chords with the D altered to D# for the first one (it's a bit ambiguous about its key being B Mixolydian or minor). - In bar 20 the sung main melody begins over the vamp from bars 8-9. It's strongly syncopic and with its D always being natural, it can be dissonant with the chords. - 0:00-0:38: The opening theme is a two-bars motif, freely improvising around a melodic line. This line is E-G-A in the first bar, followed by A-B-G in the second bar. The bass lick lasts one bar, giving an E pedal during beats 1-2, thus setting the key to E Dorian. On beats 3-4 you've got a syncopic movement. The bass goes up to varying notes and back to E via G. The theme is played instrumentally twice during bars 2-5 in the shape of a guitar chord series: I-III-IV, IV-I, I-III 7th-IV and IV-III-I. Bar 1 is a pick-up bar, with the first chord probably stemming from the preceding song ("Drowning witch" is a compilation of various tracks, recorded live during the 1982 tour). As for the lyrics you can see that they are sometimes speech influenced, sometimes musical. In bar 6 the words "ship" and "late" are on beat, but the syllables from "ship arriving too" follow the exact rhythm of the spoken words. In bar 8 the opposite happens: "try", "keep", "date" and "with" are ticking evenly. Here this goes to the disadvantage of the spoken words: the syllables "-ing to" from "trying to keep" get oppressed to the point that they are hardly audible. Drowning witch, opening bars (midi file). Drowning witch, opening bars (transcription). - 0:38-1:57. After the opening theme a through-composed block follows. It begins atonal and strongly speech-influenced. Not only the rhythm, but also the melody. See the next The man from Utopia section for more on this topic. The bass and keyboard are improvising along with Zappa. The meter remains 4/4 from the beginning of this song through bar 1 of the following example, with bass drum beats on beats 2 and 4. In bar 2 this gets interrupted for the first time with a 3/4 bar with toms on beat 3. The main drum beats are included in the example, otherwise the meter notation would become inunderstandable. In bars 5-8 you've got everything prescribed. The rhythm of bar 5 is remarkable: a 4/4 bar gets extended with one eight note to 9/8, this in combination with a sixtuplet over seven eight notes. Next the music continues in 4/4 again. The main chord progression in bars 6-8 is Fmaj7-Ab-G, making it sound diatonic again after a number of atonal bars. Drowning witch, 0:41 till 0:59 (midi file). Drowning witch, 0:41 till 0:59 (transcription). 1:57-3:12. This is the larger instrumental block from this song. It's a series of smaller themes and motifs. Next are three examples from this section. It's abstract atonal music. With its smaller time units, the third example is being played in a thrilling high tempo, especially when the 16th notes occur. The first example deals with playing around the Ab note, varying the rhythm within a 9/4 meter. The third one contains various forms of sequences in bars 1-8, to end with deliberate irregular strings in bars 9-11. Combined with the high tempo and abstractness of the string in bar 9, it's almost as if the band is firing notes at you with a machine gun. Drowning witch, 2:30 till 2:38 (midi file). Drowning witch, 2:38 till 2:44 (midi file). Drowning witch, 2:47 till 3:03 (midi file). Drowning witch, 2:30 till 2:38 (transcription). Drowning witch, 2:38 till 2:44 (transcription). Drowning witch, 2:47 till 3:03 (transcription). In the booklet for "YCDTOSA vol. III" a second version of "Drowning witch" got included. Zappa comments: "This a hard song to play. How hard? The 1984 band never played it correctly during the 6-months tour, and the 1982 band only managed to get close on one occasion. This edit collates the best efforts of both groups." 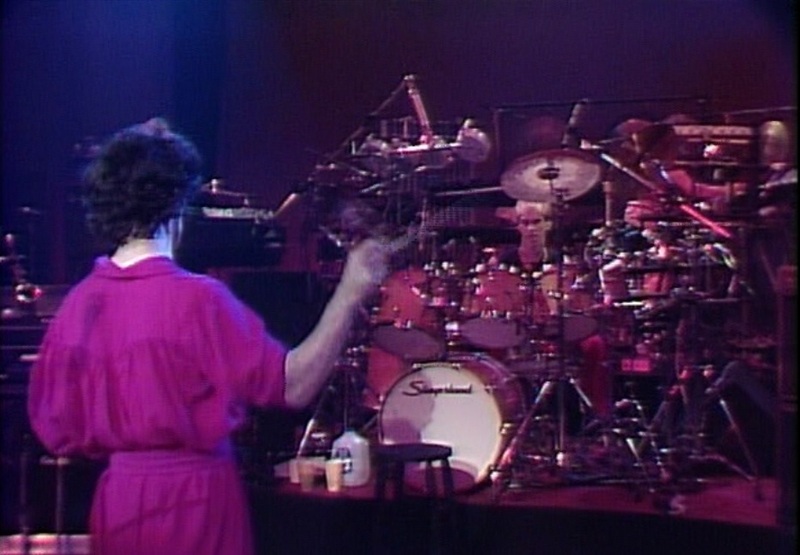 Zappa conducting his band in 1981 with Chad Wackerman in front of him (still from the Torture never stops DVD). - 0:41 till 0:59: 105. - 2:30 till 2:38: 135. - 2:38 till 2:44: 200. - 2:47 till 3:03: 165. - 4:40 till 4:52: 100. - 11:07 till 11:17: 130. The 1982 album version is a highly edited compilation of tracks from the 1982 tour from a number of concerts. Zappa comments in Guitar Player, February 1983: "Do you know how many edits there are in "Drowning witch"? Fifteen! That song is a basic track from 15 different cities. And some of the edits are like two bars long. And they are written parts - all that fast stuff. It was very difficult for all the guys to play that correctly. Every once in a while, somebody would hit the jackpot, but it's a very hard song to play. So there was not one perfect performance from any city. What I did is go through a whole tour's worth of tape and listen to every version of it and grab every section that was reasonably correct, put together a basic track, and then [I] added the rest of the orchestration to it in the studio." - A-B-C-D-E-F-G#: A minor (the common variant with a major 7th). - A-B-C#-D-E-F-G# and A-Bb-C-D-E-F-G#: self-created scales, sort of Gypsy type scales with F-G# as an augmented second in it. In the example below you have A-A# (Bb), G-G# and C-C# next to each other, showing the degree of chromaticism in this solo. In the background harmony by the keyboards you always have a G# and the notes mosty used by the keyboard are the ones from the E7 chord, often as arpeggios. The example begins with a dissonant feedback chord, howling softly. Drowning witch, 4:40 till 4:52 (midi file). Drowning witch, 4:40 till 4:52 (transcription). 6:46-7:14. A relatively short block, made up three smaller themes. The first is a melody over a chord progression, the second a string of unisono 16th notes. The third is a guitar melody over an F# pedal. 7:15-11:06. Other than the first above, this one is more like a regular Zappa solo. It's stable in B Dorian and the meter is 12/8. - F#-G#-A-B-C#-D-E: F# minor (Aeolian). - F#-G#-A-B-C#-D-E#: F# minor (the standard variant with a major 7th). Drowning witch, 11:07 till 11:17 (midi file). Drowning witch, 11:07 till 11:17 (transcription). On the F chord the F and C once appear as natural in this section. Of the series F#m-F-Asus2, the A they have in common is held as the upper note and you've got a chromatically descending fourth for the other two notes of the chords: C#+F# => C+F => B+E. In the next bar there's no such pattern. The transitions are kept fluid because about all chords have notes in common with the previous chord, which is the norm for traditional harmony. Thus Zappa can do it this way, but he can also bluntly jump from one chord from one scale to another chord from another scale without binding notes, like in "Uncle Meat" or "Would you like a snack". This is the rock-band version of "Envelopes", a modern atonal piece that was also orchestrated for the L.S.O. recordings. The previous L.S.O. section contains an example from this composition. There are many differences between these two versions. The original version on the ZFT release "Odeon Hammersmith" goes different as well. At that point this composition had lyrics. Frontside of the inner sleeve of the original Drowning witch album, with Zappa advertising for the Shut up 'n play yer guitar box (not included in the CD booklet). Shown here oblique, as also on the sleeve. The other side had the lyrics on it. - 0:00 Intro with the guitars and bass hammering on the E.
- 0:05 Phrase 1 (She's only seventeen ...), played three times. - 0:12 Phrase 2 (She's a teen-age prostitute). - 0:29 Phrase 6, played twice. - 0:39 Phrase 1 (She ran away from home ...). - 1:02 Phrase 6, played twice. - 1:12 Phrase 7 (I have got a pimp ...). Teen-age prostitute, section (midi file). First block with lyrics returns instrumentally, followed by another return of the instrumental block. - 1:27 Phrase 1. The example above starts with the third repetition at 1:32. The meter is standard 4/4 and most of the rhythm in this song is regular. The scales on the other hand are only implied with altered/chromatic notes turning up all the time. It's one of the many examples I'm calling multi-scale in the Burnt weeny sandwich section, with many scales getting touched upon only briefly. In bar 1 of the example (the fourth bar of the phrase) the implied scale is C Mixolydian. - 1:35 Phrase 2. The music is diatonic, but the bass is moving too much to confirm a tonic. - 1:38 Phrase 3. Bar 3 in 3/4 is chromatic. Bar 4 is in 4/4 again, with the implied scales being C# Locrian during beats 1 and 2, and C Lydian during beats 3 and 4. - 1:42 Phrase 4. An ultrafast descending chromatic line in 6/8. It turns up three times during this composition with the details being different, so it's probably improvised along the idea of six times four 32nd notes and six eighth notes for the bass. 1) Bass G# with the F#m chord, implying G# Locrian or Phrygian. 2) Bass G natural with the F#m7 chord, implying G Lydian. 3) Bass G natural with the Ab chord, implying G Phrygian. 4) Bass F# with the Ab chord continuing. This is transitional with the combination not being a standard datonic scale. 5) Bass F# with the G chord, implying F# Locrian or Phrygian. 6) Bass F natural with the G chord continuing, implying F Lydian. - 1:51 Phrase 6. Rock music in E Locrian as the best fitting scale for the whole. Altered notes can turn up. The keyboards are playing an upwards parallel movement of fourths, always before beat. The example above stops at 1:57. - 2:01 Phrase 1 (The tiny little pants ...). - 2:19 Applause, fading out. At this point it comes out the best that various tracks were recorded live. At a few other instances the audience can be heard lightly in the background.